We’ve crafted custom and architectural millwork since 1899. It’s our passion, and that shows in the quality, detail, and soul we put into every single woodwork project. Stay in touch and receive exclusive offers. Contact us with any questions and comments. Wood countertops deliver an incredible presence and balance to any space. Discover why so many designers are turning to the beauty and durability of natural wood countertops for kitchen, islands and bars. Get an estimate for your custom wood countertop. Stairs make a strong architectural statement. Find out how our team of craftsmen and professionals can creatively solve any structural or design challenges from initial design to the finished installation. Get an estimate for your stairs. We'll customize windows and doors according to your home's unique style and space. Find out how our 60 years of experience in the window and door industry assures that your project will exceed your expectations. Get an estimate for your windows and doors. From arched casings to crown moulding, bookcases to library paneling, hand-hewn beams to mantles, we've got your custom millwork needs covered. Our collaborative approach ensures that your ideas reach their full potential. Get an estimate for your custom millwork. 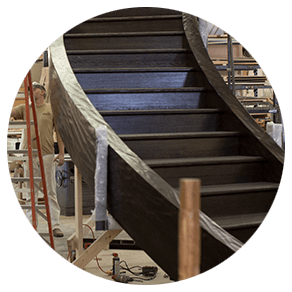 Kirkwood Stair & Millwork has a deep, rich history of designers, craftsmen, wood carvers, and installers who create handcrafted, custom millwork - from stunning stairs to sleek wood countertops -- to your precise specifications. 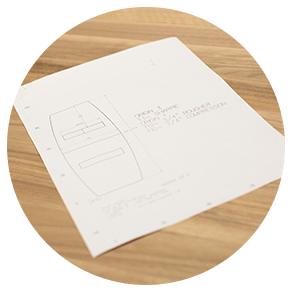 Our builder, contractor, homeowner and designer clients rely on us to make their woodwork concepts and plans come to life. Our company has a cool culture - one that inspires each of us to do our best work with precision, timeliness and artfulness in our effort to always exceed expectations. One of our greatest rewards, truly, is to see how happy we’ve made our clients.